Kingston CF/32GB-U2 Compact Flash Card kopen? | That's IT! Advanced amateurs and professional photographers need Flash memory they can count on for even the most demanding shoots. That’s why Kingston® has enhanced its CompactFlash® Ultimate cards. 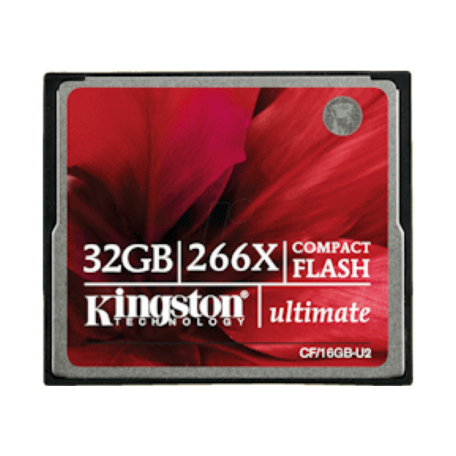 Kingston CompactFlash Ultimate offers an amazing write speed rating of up to 266X, making it one of our fastest cards to support high-end digital cameras and devices. It’s designed to deliver superior results with fast data transfer and support for continuous shooting. With its ultra-fast transfer rates of up to 45MB/s read and 40MB/s write, you can capture more continuous, high-resolution images in less time with the CompactFlash Ultimate than with traditional CompactFlash memory cards. For added peace of mind, CompactFlash Ultimate comes with a bonus download for data recovery software from MediaRECOVER®. With MediaRECOVER, you can recover lost or deleted files and restore corrupt files on Windows or Mac systems. To ensure that Kingston Flash memory solutions are among the performance leaders in their class, Kingston engineers select high-performance controllers as part of each card’s design. Each card is 100 per cent tested and you can rest assured that every CompactFlash Ultimate card has received a perfect score. Available in capacities of up to 64GB*, CompactFlash Ultimate offers plenty of room for capturing and storing high volumes of images in RAW, JPEG, TIFF and other large file formats. As with all Kingston Flash cards, CompactFlash Ultimate cards are backed by a lifetime warranty and the legendary reliability that makes Kingston the leader in memory.